A Doctor's Coat for Genesis 2 Female for use in Daz Studio 4.6. Open-Close Coat morph. Movement handles in coat. Several morphs included for fitting over clothing. I continue to love this so much I use it for lab coats as well. The fact that it can handle being both closed and slightly open is absolutely wonderful. Combined with the ability to manipulate the bottom of the coat, this is just great. The top buttons do have issues disappearing when worn by characters with large bust sizes, but I've never felt the need to look for a "better" coat than this. I liked it, so nice place y thank you. Fantastic and very useful.. Thanks so much.. I apologize for not thanking you sooner. A much needed item. Thank you very much. thanks very much. This will certainly be very useful to me. Thank you, this coat is very useful! I wish you a happy (and healthy ;-)) 2015! Thank you again and hope you have a great new year. Thanks Wendy, you did the community a great service here. 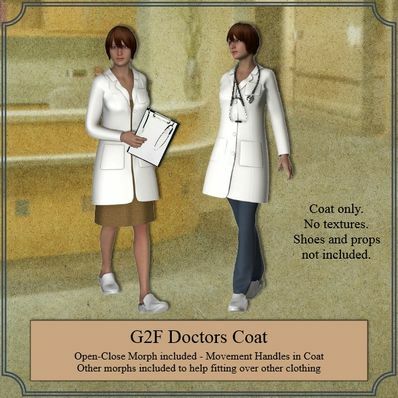 I'm not sure a Doctor's Coat even exists for G2F, so thanks! Welcome addition to the library. Thanks. Thank you for this wonderful Doctors Coat! I wish you a happy new year! Wonderful thank you very much!